Income and capital breeding describe two dichotomous breeding strategies that characterise the allocation of resources to reproduction. Capital breeders utilise stored endogenous resources (typically lipids) to finance reproduction, whereas income breeders use exogenous resources (typically carbohydrates). The basis for such characterisation has mainly come from studying females, yet for many species, male and female reproductive success may be determined by substantially different factors. Females allocate resources to offspring production, whereas males typically allocate resources to accessing mating opportunities, e.g. from contests or displays. The primary metabolic fuel (lipids or carbohydrates) in males appears to be dependent on the type of activity being performed (i.e. high vs. low intensity or long vs. short duration), rather than capital or income breeding strategy per se. Males performing sustained, long-duration effort typically utilise lipids, whereas those undergoing intense activity more often utilise carbohydrates. As a result, either fuel type can be used in either strategy. 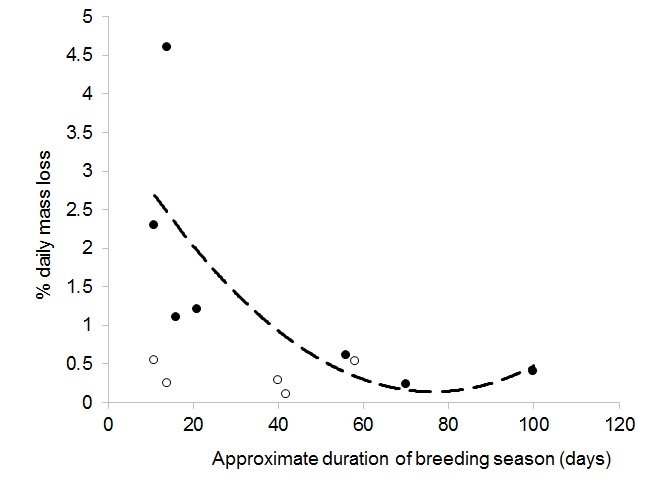 Breeding season duration can constrain strategy choice; lipids and carbohydrates can be used in short breeding season species, but only lipids provide a viable fuel source for long breeding season capital breeders. Both capital- and income-breeding males must manage their resource use during the breeding season, but capital breeders must also cope with physiological stressors associated with extended fasting. Overall, the capital–income breeding concept applies equally to male reproduction, but compared to females, there are different physical and physiological constraints that shape choice of strategy. This Commentary also highlights some key future areas that need to be investigated to further understand how capital–income breeding strategies shape male mating strategies.